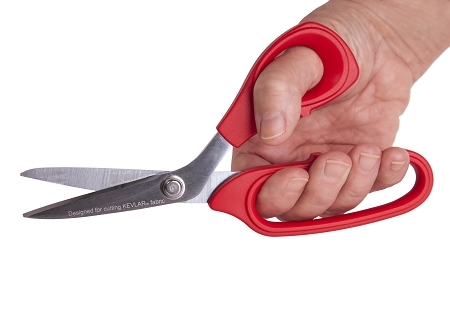 These shears efficiently cut materials made from aramid, para-aramid fibers and composites such as Kevlar®, Dyneema®, Vectran®, Spectra®, Technora®, Nomex®, Innegra®, Dacron and other blends made from fiberglass and carbon fiber which ordinary scissors cannot cut. Its blades are made of high carbon alloy steel from Japan and are infused with Molybdenum and Vanadium through a proprietary manufacturing process to harden the cutting blades (HRC 60-62, HCV 120) needed to cut high-technology materials. The ergonomically designed large grip-ring delivers more power with reduced fatigue and wrist strain. The grips are designed to easily fit in the power portion of the hand to produce cleaner cut with less effort. One blade is micro-serrated to avoid slippage and the other can be sharpened to extend life. The tang on the blades is long to provide cutting efficiency. To cut composite-grade materials is a very difficult task. These 8" shears are meant for clean long cuts into sailcloth (especially multilayered) , rope, canvas, vinyl, leather, plastic, silk, cotton, nylon and other knitted, non-knitted, stitched, unidirectional/bi-axial/triaxial/quadraxial materials. Please see videos showing few of these materials being cut. The handles are ambidextrous and comfortable. It is an excellent shear for marine, clothing, electrical, cabling, upholstery, safety and construction industries. It can also be used for splicing all type of halyards, sheets, topping lifts, lazyjacks and control lines. Sailmakers and riggers around the United States use these shears in their daily projects to cut fabric, thin ropes, sleeves and tapes. Fabricators who use fiberglass and carbon fiber materials have replaced their current shears in favor of these 8" shears. I highly recommend this specialty shears. I was not disappointed at all. I work with with Mylar/Kevlar cloth and nothing cuts it like these shears. I went through four different scissors before finding these. These ACTUALLY CUT through the stuff easily as if cutting through paper. Price is no concern; THEY WORK. These shears work really well for cutting woven Kevlar fabric and for cutting leather. The grips are comfortable and will work in either the right or left hand. They are very high quality. I was happy because the serrations of one blade gave non-slip cuts (we know normal shears won’t even Kevlar). I was able to cut two and three layers of Kevlar fabric. If you have a thicker Kevlar panel that is composed of multiple layers then it requires more force which is not comfortable. You can cut through one/two layers at a time though. The shears do eventually become dull but I was told one blade can be sharpened. To my surprise these can actually cut Kevlar. I am telling my mates. The best in my experience. They cut through fabric like cutting through butter. The blade performance is the same across its length - nice to cut frills too. Great pair. I was able to cut through neoprene very easily! Try it. The shears are working out great. Starting to load up all our workstations with them. Thank you very much Ascend Tools! These are great products and hope to order some soon! A pair of scissors that actually cut Kevlar, cut it well, nice and neat. I thought it will wear out quickly and I may have to buy a second one but two months later it is going steady. I love these shears. I rely on them for all our Spectra work. My son and I came in over the week to get ready for Long Beach Race Week and we work on our sail most part of the week using these shears primarily. I have asked these guys to bring in a longer shear; I hope they do soon.